Mr Bunny used to live in the guest bathroom but I moved him back out to the photo wall. I bought him at an art exhibit at Seibu Loft (aka heaven) last time I was in Japan. I am not sure of the artist's name due to my lack of Japanese. 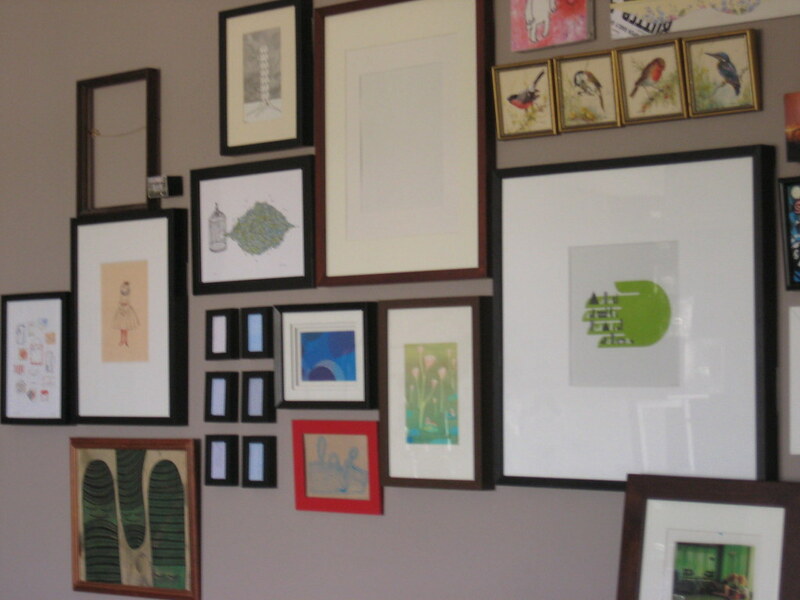 I keep seeing blog posts (most recently on From the Right Bank) about art walls, with elaborate planning of the position of each frame, either using CAD or cutting out paper to represent each frame and sticking it on the wall, or laying all the frames on the floor until you decide on the best layout. Wow. Mine have just been stuck up there completely at random. If I had a spirit level I would probably have used it but I find all the wonkiness cancels itself out. Meh. 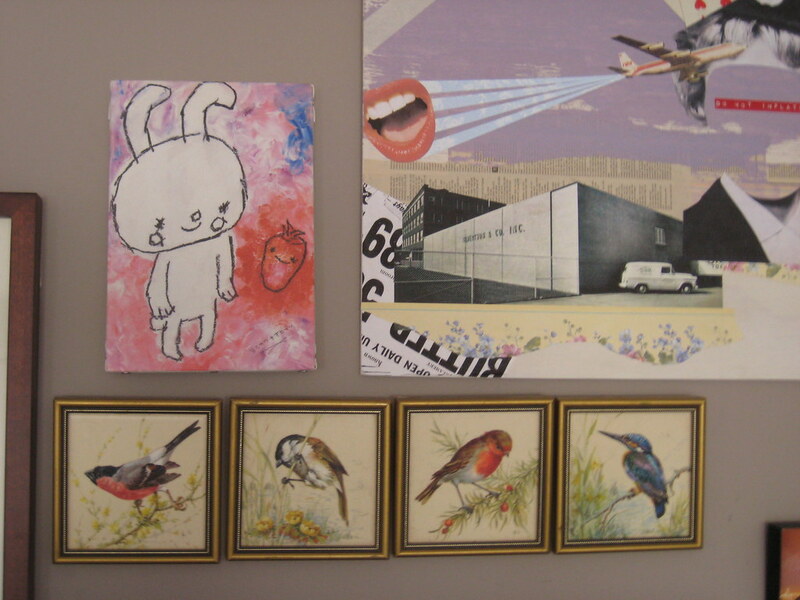 I love your wall and mix of really different pieces! Thanks for stopping by my blog and the shout out too. Oh, and I love Seibu too!!! I could spend an entire trip to Japan just hanging out in that store. dude! i have way too much art, too! so far i haven't been hanging it the way you (and others) have, but i need to start. love the look! i think i am just a bit of a chicken. and i HATE measuring, and i HATE re-doing stuff. bleh! I love where your art wall is headed -- just goes to show you don't have to CAD to be rad. 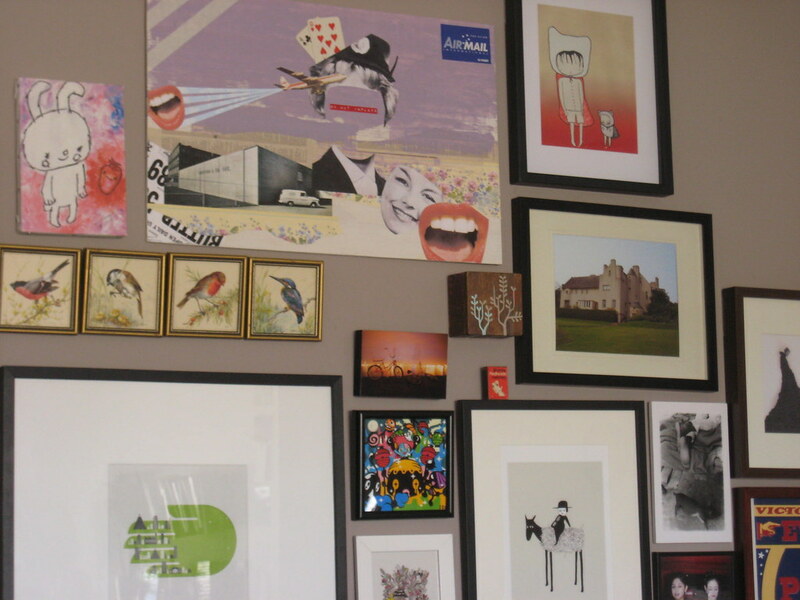 This is exactly the type of wall collage I want to do! I need to get started. I love art walls, but there's no way I'm going through the trouble of CAD arranging to get it just right. I thought the point was to have a random collection...or maybe that's just how I do it!